Dapple dachshunds can have long or short hair. 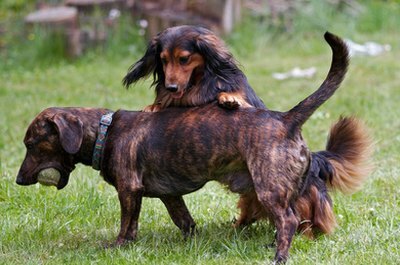 Dapple dachshunds have patches of color with their base coat color showing through. 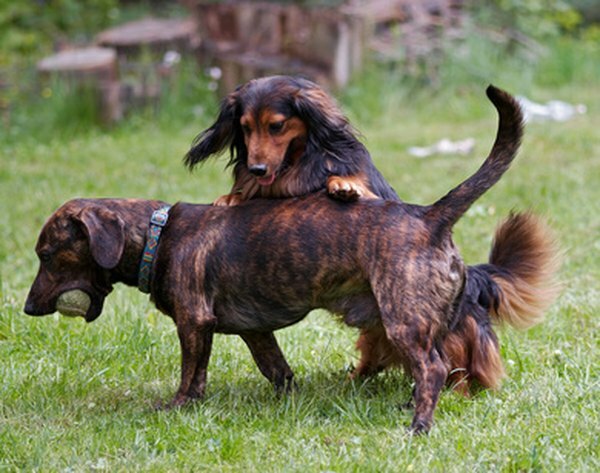 For example, dachsies with solid black bodies often have patches of gray dappling over their black fur. For the most part, caring for a dapple dachshund is not any different to caring for a dachsie with a non-dappled coat. Establish a relationship with a veterinarian you trust. Make sure your dachsie's vaccinations are up to date, and have annual check-ups performed on a healthy dog. If your dachshund has any known health problems or concerns, get these attended, monitored and -- if necessary -- medicated by a veterinarian. Veterinary care can be expensive, but skimping on health care for your pet is unfair and can be cruel. Feed your dachshund regular and appropriate portions of a suitable, balanced dog food. Because dachsies are relatively small dogs, they do well with food that comes in small chunks or kibbles. Follow the feeding instructions on the specific dog food packaging to determine appropriate portions and feeding times. For example, an adult dachshund may need one cup of a particular brand of dog food daily. You can split this into two daily meals of half a cup, or one cup every morning. Make sure your dappled dog reaches and maintains an appropriate weight for its size. Overfeeding a dachshund quickly leads to obesity, which can injure the dog's long back. Establish a grooming routine for your pooch's dappled fur. Long-haired dapple dachshunds will need more grooming to ensure their fur does not become tangled or matted. Dachshunds can be bathed in a regular tub or sink -- their skin can be sensitive, so use a gentle dog shampoo. If you live in an area with Lyme disease, apply a monthly tick preventive -- solution or collar -- to your dachsie's fur after bathing. Train your dog with commands that will maximize health, safety and happiness. It's important your dog comes when called. Because a dachshund's long back is quite fragile, train your dog to stay at ground level as much as possible. Don't encourage jumping up, or jumping from couches and furniture -- these behaviors can lead to back problems and disc rupture. Provide your pet with plenty of opportunity for exercise, whether on a leashed walk or running free in your back yard. Do your best to monitor, prevent and care for potential health problems that are specific to the dachshund breed, or dappled dogs in particular. As a breed, dacshies are susceptible to back and neck problems, which can be very serious. The incidence of epilepsy and seizures is also higher among dachshunds than among most other breeds of dog. Double-dapple wiener dogs -- which have white markings with blue or dark-colored eyes -- are at risk of a genetic problem based on their breeding from two dappled dachshunds. This specific genetic problem in double-dapple dogs can cause physical or sensory problems, including deafness or blindness. Dappled dachshunds are commonly bred together with non-dappled dogs to reduce the risks associated with breeding double dapple puppies. Is the Color of Hair That a Kitten Has the Same When it Is a Year Old? Can Irish Terriers Have Black in Their Coats? When Do Baby Goldfish Turn Orange? What Type of a Cat Do You Have if It Is Black? Will a Dachshund Stop Eating When Left Alone Too Much? What Is a Piebald Dachshund? Which Large Breed of Dog Can Be Brindle in Color? What Is a Calico Tortoise Shell Mix Cat?